Whether you're loyal to hair dye and hot tools or are diligent about air-drying, all hair loses its luster from time to time. Trying to find a hair mask that smooths and repairs without leaving strands limp can be a challenge. Many additives in deep conditioners coat the hair shaft for temporary smoothness and do nothing for its condition in the long run. Eggs and mayonnaise combine for a treatment that looks after everything from dryness to thinning hair. Trade in your usual conditioner for this moisturizing duo twice a week to repair your locks. Mayonnaise contains many of the properties found in store-bought hair masks. It contains oils that deeply moisturize hair, making it ideal for dry or chemically processed hair. It also coats hair much like silicone to add shine and protect it from heat styling. The protein content replenishes weak strands to prevent breakage and encourages new growth from the root. Its combination of oil and protein make it a suitable option for those with fine hair who may find undiluted natural oils too heavy on their hair. Eggs are rich in protein and help to strengthen and thicken hair. Unlike chemical thickeners, eggs keep the hair's natural oils intact so they are easy to comb through, resulting in less breakage. They are effective on hair that is thinning or damaged from heat styling and coloring. 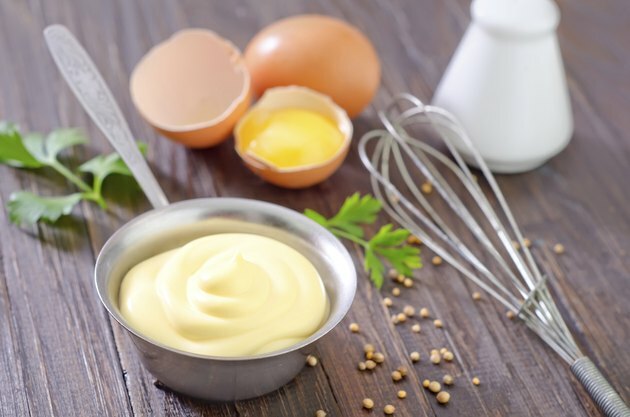 Eggs work well with mayonnaise, as they seal the cuticle to lock in moisture and make the results long lasting. Pour 5 tablespoons of mayonnaise into a bowl and add 2 raw eggs. Use a whisk to mix them together until fully blended. It is best to mix the treatment by hand to avoid turning it into a liquid that won't adhere to your hair. Add a teaspoon of vinegar or olive oil for extra shine if you have coarse hair. Dip your hands into the mixture and pull it through your hair from root to tip. Continue until your hair is completely coated. Pull a plastic shower cap on over your hair. Heat up a towel in the dryer and wrap it around the shower cap. The heat from the towel will help the moisture soak into your hair. Leave the mask in place for 20 minutes and then rinse your hair completely with warm water. Pour a dime-sized amount of sulfate-free shampoo into the palm of your hand and work it into the roots of your hair with your fingertips before rinsing well. This removes any buildup without stripping your hair of the moisture and protein. Gently towel dry the ends of your hair and style as desired. Apply the treatment once or twice a week.